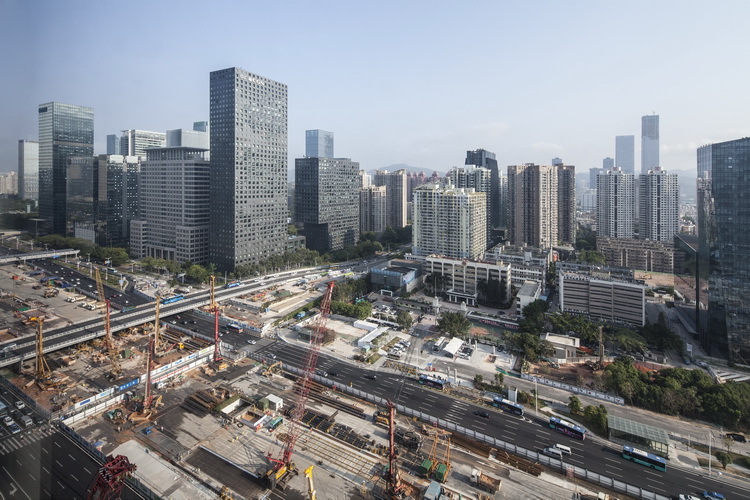 Client: China Guangdong Nuclear Power Group Co., Ltd.
After more than ten years of rapid development, the Shenzhen Central District has begun to take shape. 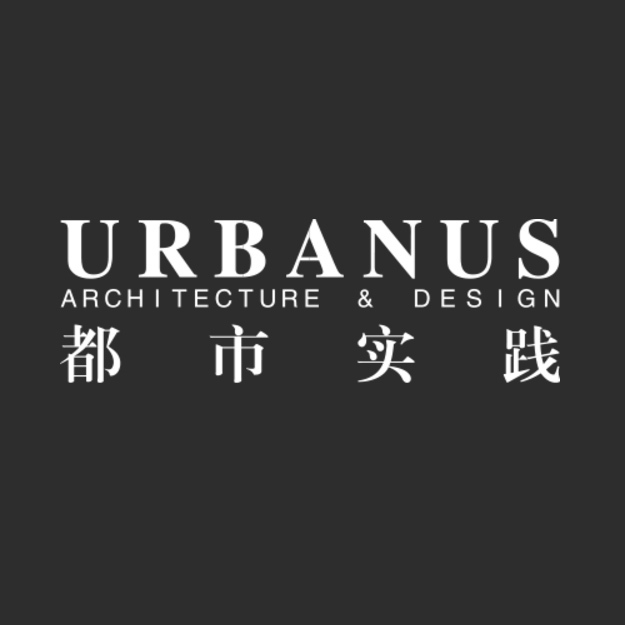 However, in the pursuit of absolute uniqueness within each individual building, the lack of subtle echoes between buildings has led to the ultimate loss of integrity within the urban center building group. 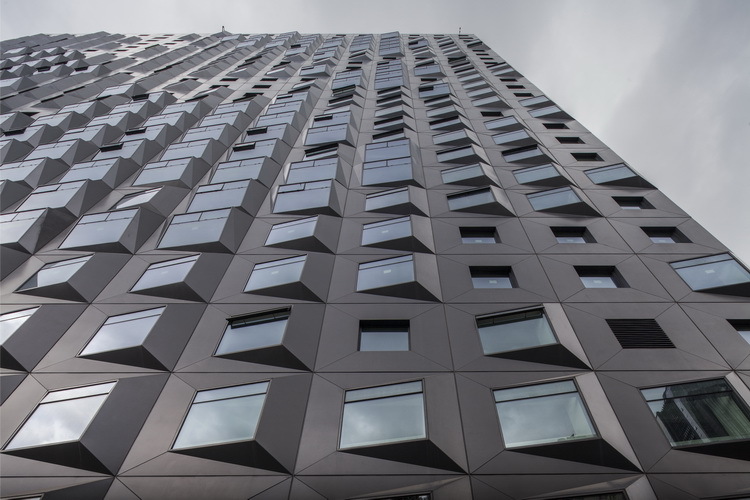 Tracing back to the essential features of high-rise buildings: efficient, comfortable, energy-saving and environmentally friendly, clear-cut, and going back to those architectural classics can sometimes make buildings stand out in current perplexed urban background. 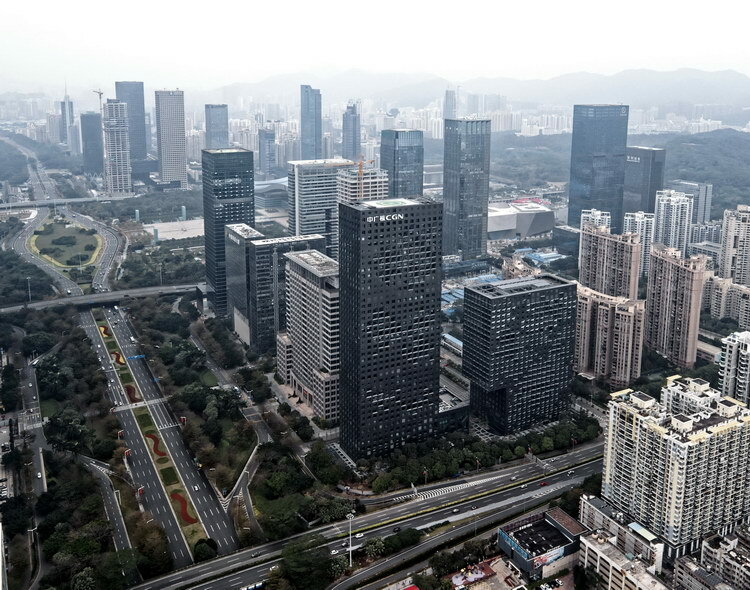 Zhongguang Nuclear Building is located in a long and narrow north-south oriented site at the intersection of two main roads in the central area of ​​Shenzhen’s CBD. 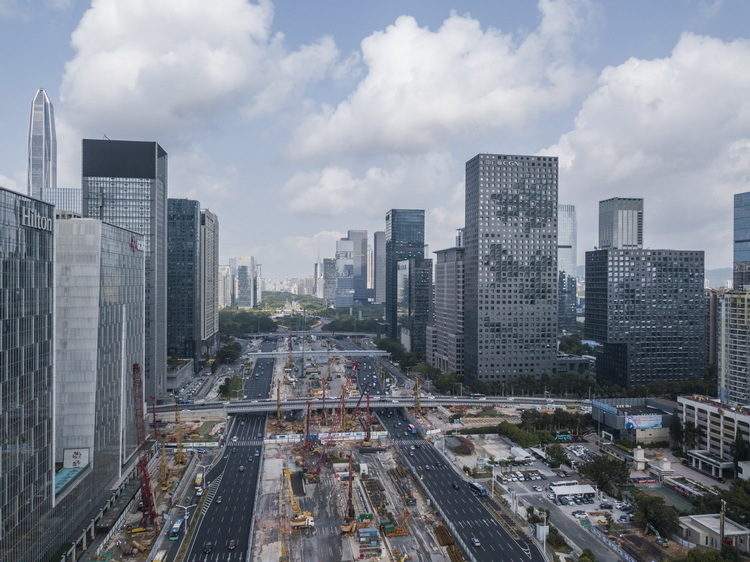 It is surrounded by Caitian overpass in the east, Shennan Avenue in the south, closed high-rise residential area in the north, office building in the west, with limited amount of small size commercial area. 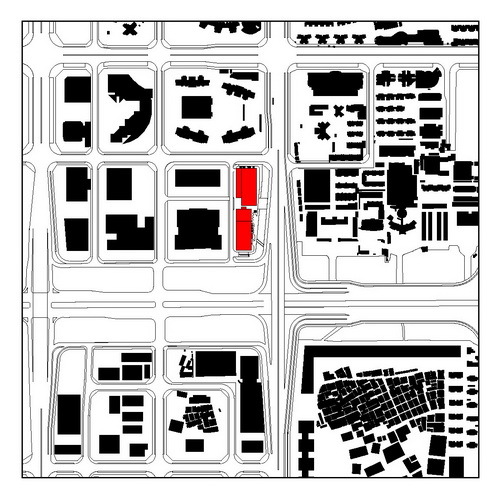 The urban life around the site is separated by the islet-like buildings, which cannot be effectively connected. 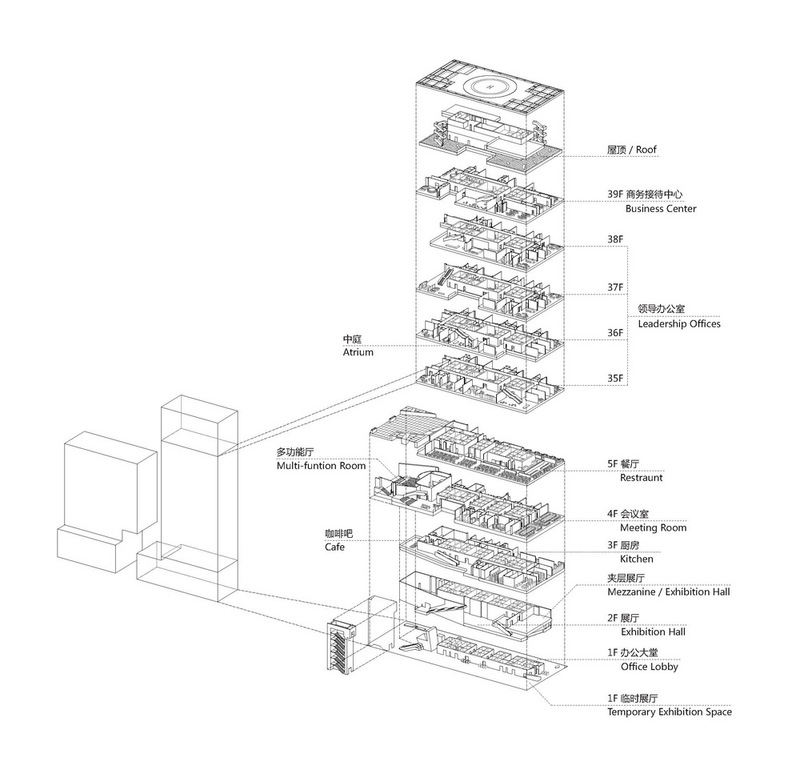 The space system of the entire block needs to be integrated. 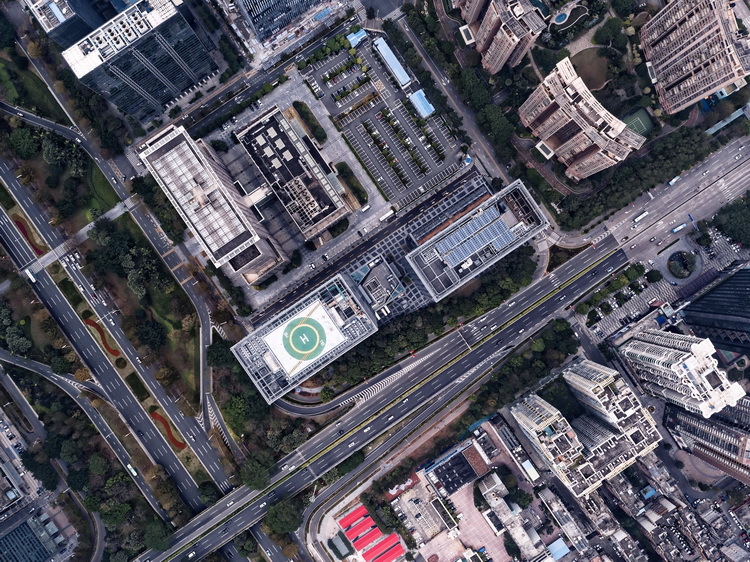 The two buildings of Zhongguang Nuclear Building are designed to fill the east side of the site as much as possible, intertwined in plane and space, to maximize the use of the landscape resources on east and west side of the streets, which also forms the overall layout of the two block. The upper part of the northern block is cantilevered 15 meters southward, forming a large covered space above the main entrance to the site. 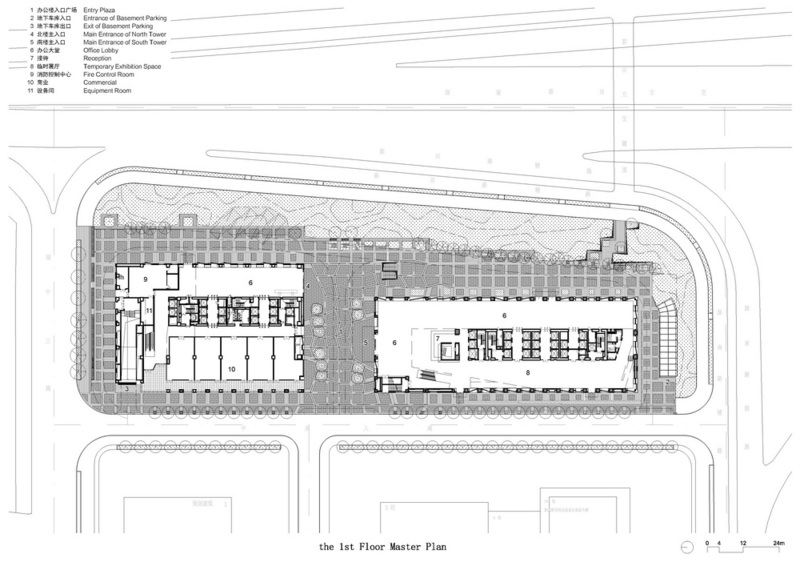 The bottom three floors are extending westward to accommodate commercial space and leave an arcade along the street, echoing the public area on the north side of the southern block. 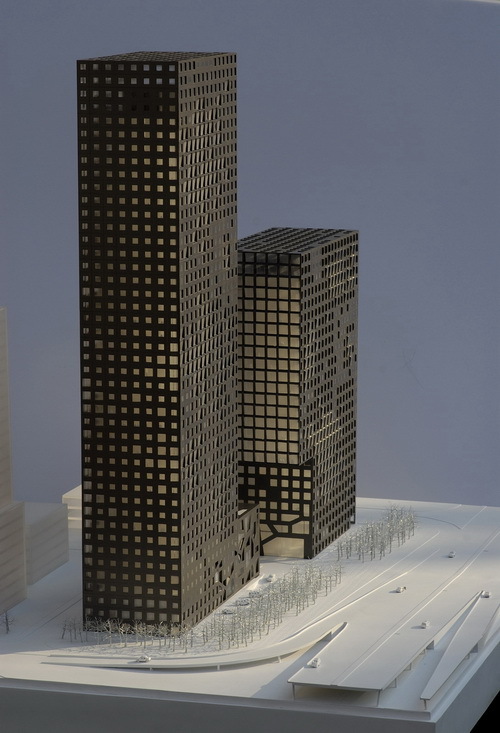 Turning away from the usual design of annex buildings, the southern block towels over the site, follows the configuration of the tower therefore become an extension of the tower, altogether forms a complete L-shaped volume. 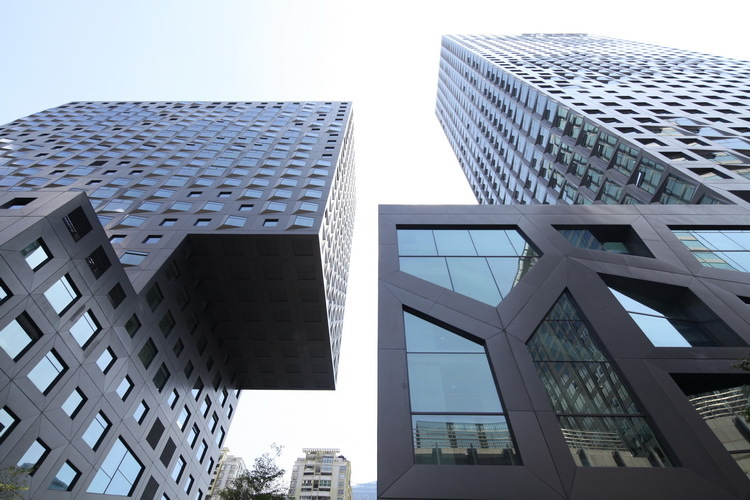 The two occluded buildings present themselves as a giant rocks splited and shifted in the middle to form a spatially enclosed public area, connecting the dull urban spaces on the east and west and laying a public plaza that contains the shadow of sky and clouds. 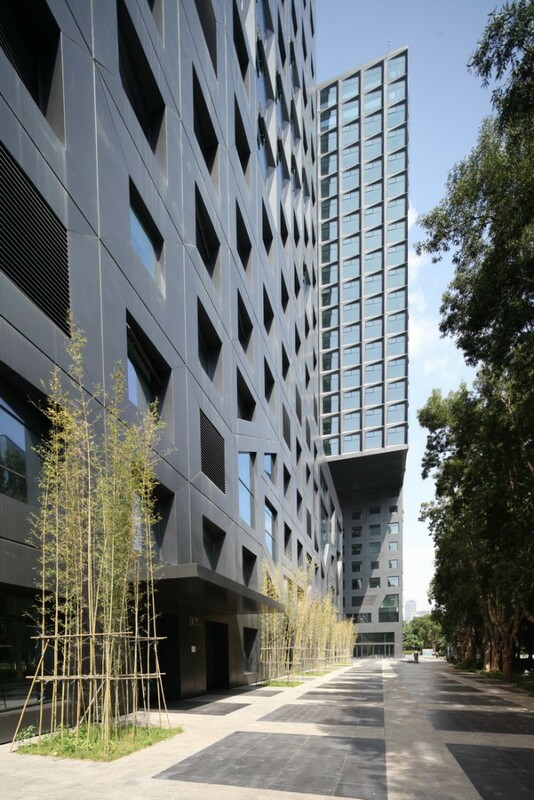 In the floated irregular stone platforms, a group of trees glittering under the morning and afternoon sun became part of the landscape between the gap of the building. The entrance to the southern block opens to the north side plaza, with a triple spaced entrance hall. 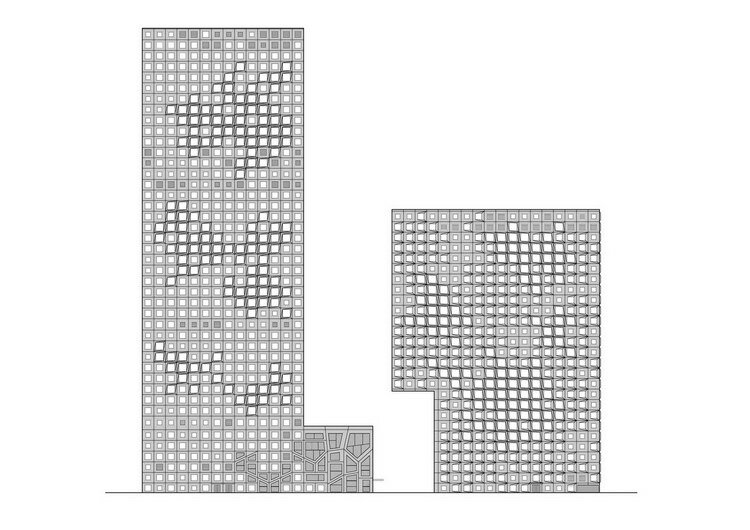 The massive gridded windows on the east, west and north sides allow sunlight and natural scenery to enter. 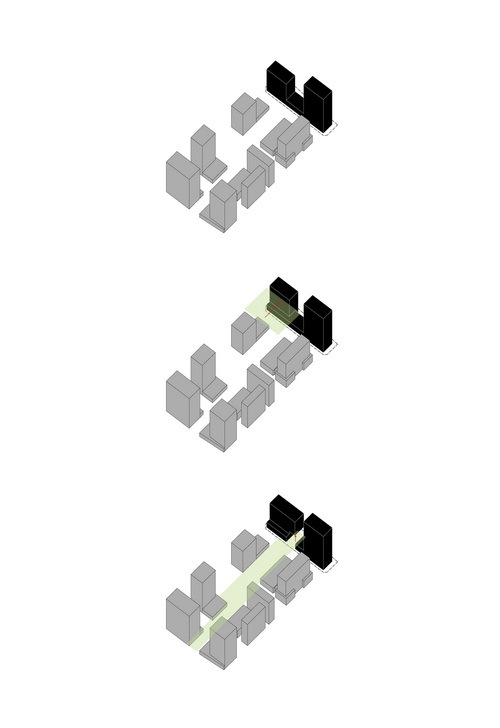 The public space within is spatially designed as of a box with a serious of small boxes suspended and stacked within. 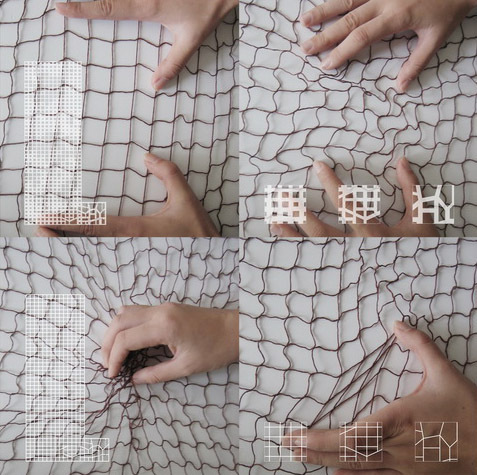 The correspondences and interconnections between each space generate a transitional communication zone. 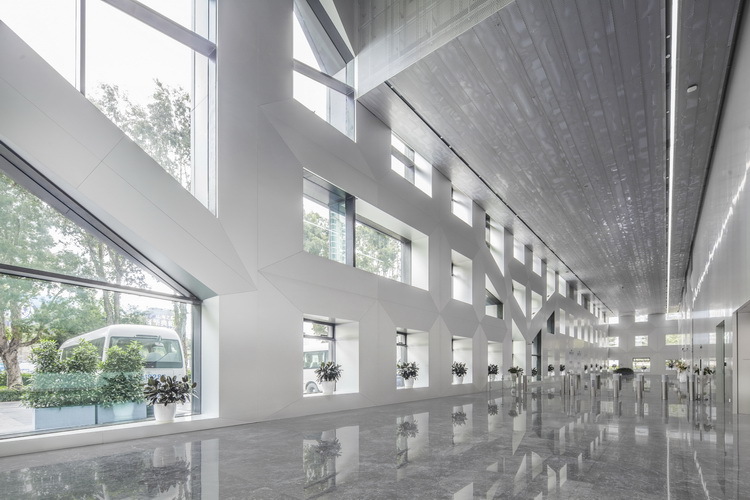 A translucent exhibition hall hangs within the triple hight entrance hall, with a conference hall above, and a dining and rest space for the staff members in between those two volumes. 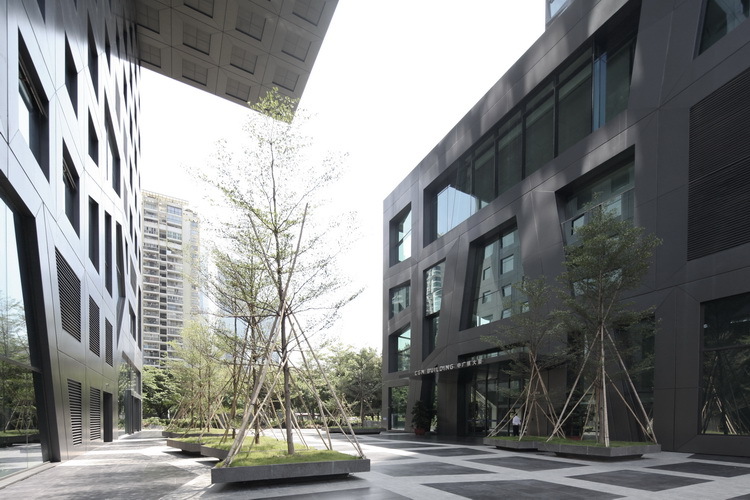 The office lobby is placed on the east side of the first floor, as the west side serves as the corporate culture exhibition space, and the north and south ends are equipped with resting areas and lobby bar. 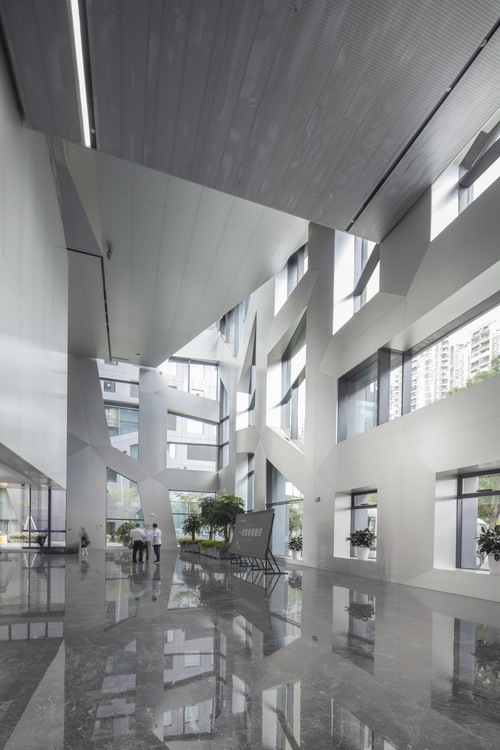 The office space on the upper floor is also connected with series of internal public stairs. 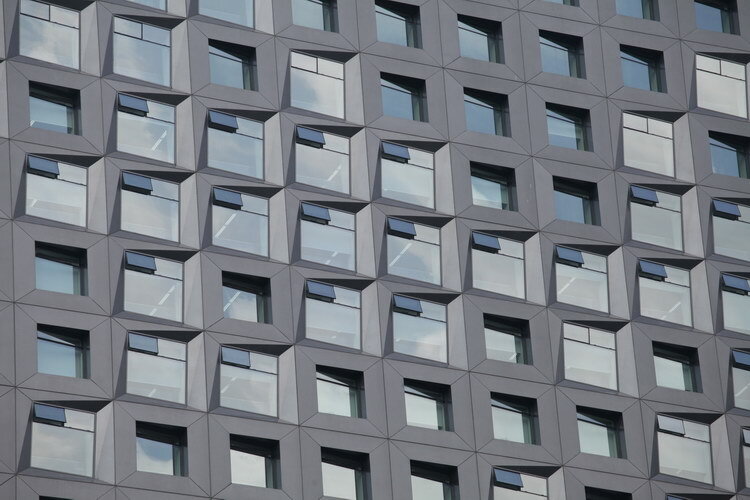 The chaste texture of the façade of CGN building has demonstrated a digital aesthetic derived from computer, network and multimedia technology. 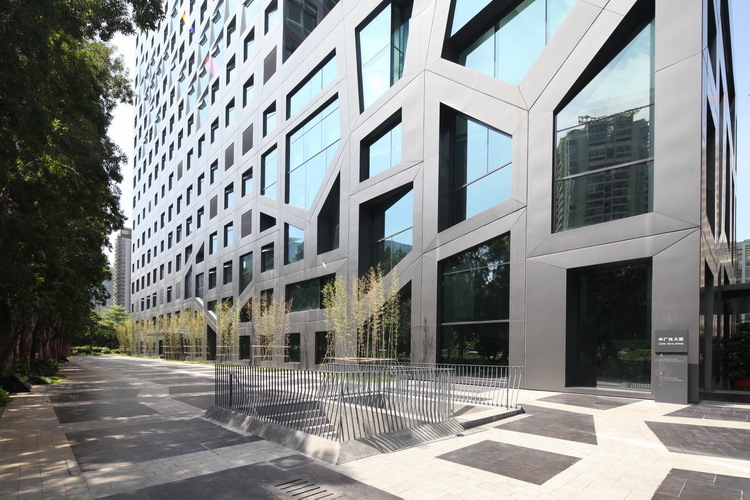 The exterior of the building abandoned the typical large-area glass curtain wall that is used today and returned to the basic window-wall opening system. 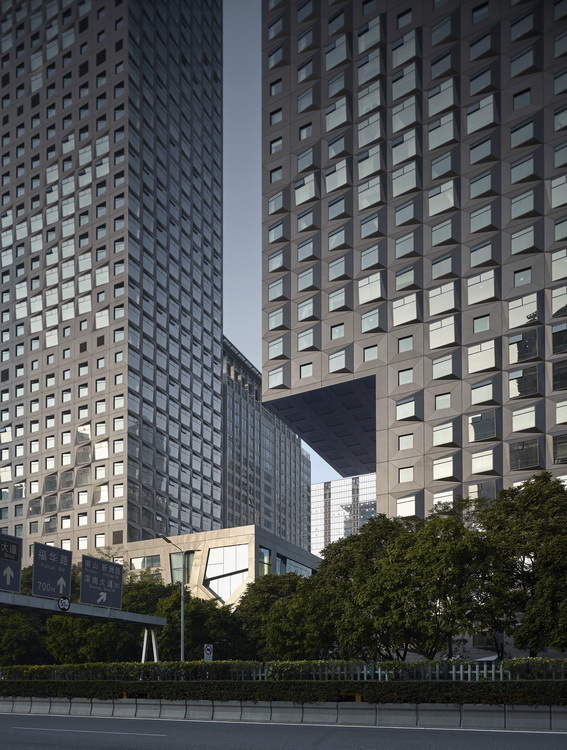 These windows vary in size, direction and depth, which gradually transform into grid fissions and extensions on the podium, supporting the floating grand meeting room, dining hall and exhibition hall. 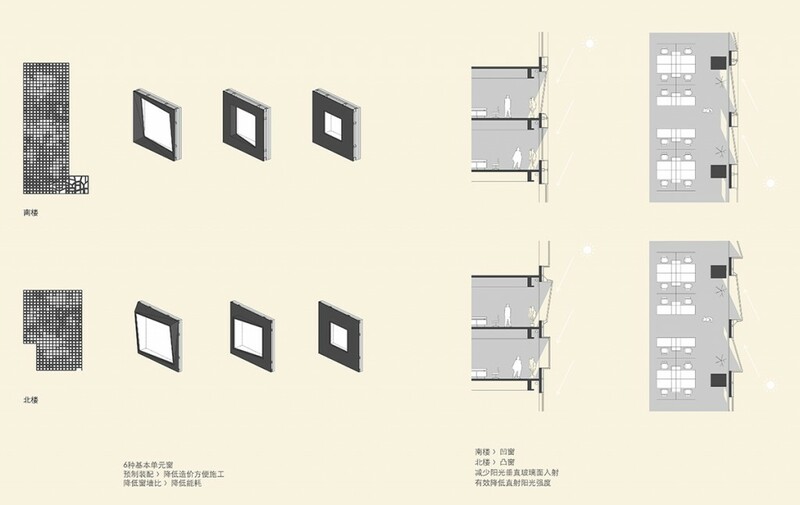 By using these modular units, the spatial system of this gradient changes and partial upheaval acts as a metaphor for the fact that nuclear power is becoming a major energy industry. 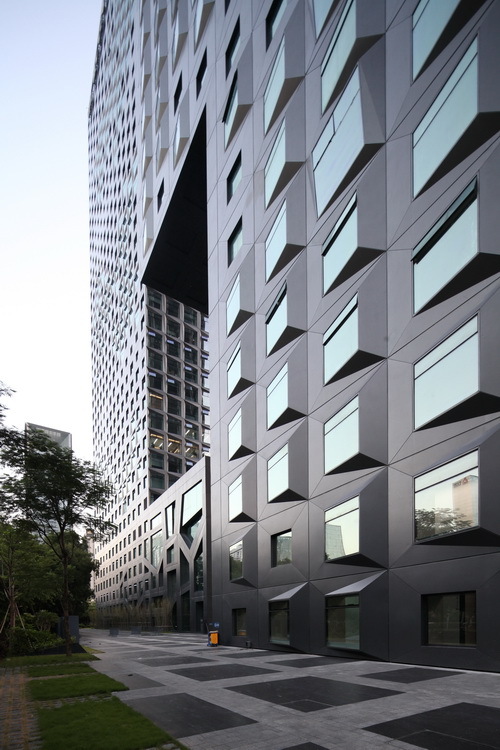 At night, the light filtering through the façade generates a crystal-like surface that converges through the changing grid of the building, making the exterior of the building look like a monitor screen that can accommodate infinite changes while also expressing the architectural energy through its subtle design. 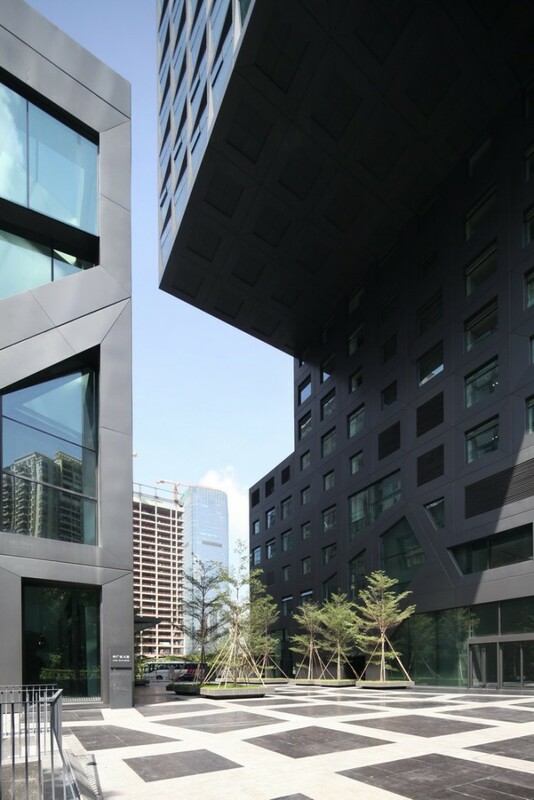 The dark gray metal texture used on the exterior wall further strengthens the corporal expression of CGN headquarters. 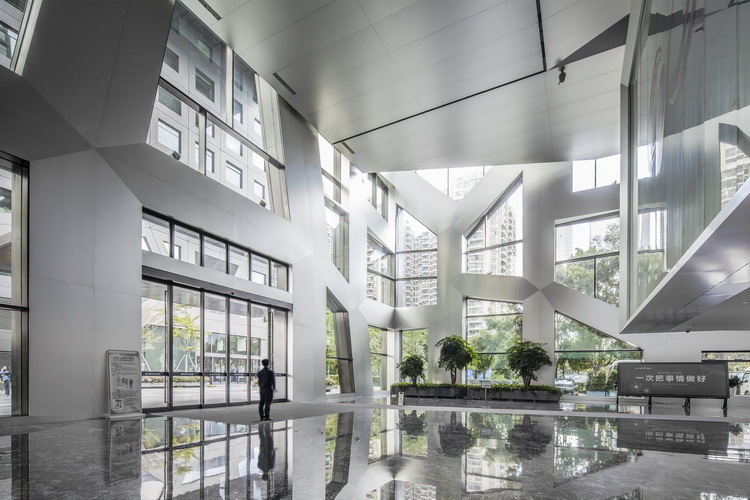 We choose to deliver the sense of energy through the chaste and humble façade, so that the headquarters building reads as clear and concise afar, yet rich and varied close up, which altogether deliver the image of a rigorous, steady and future-driven industry leader. 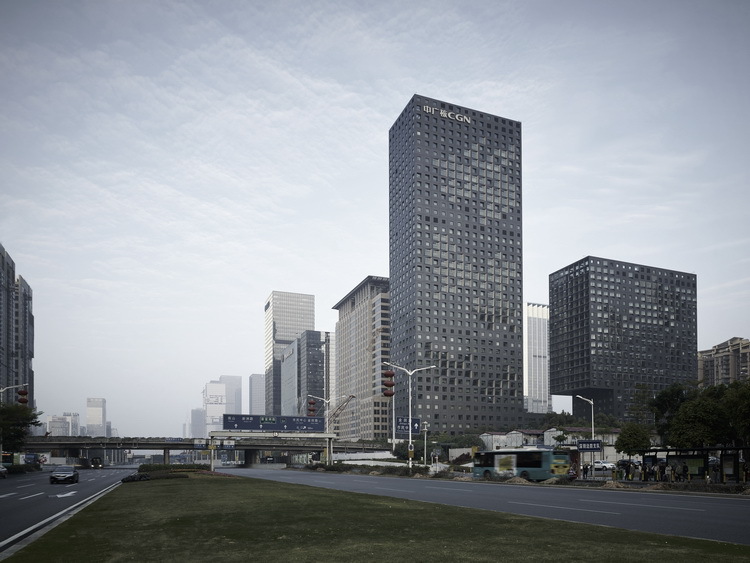 At the same time, the design of the building also corresponds to the dark color scheme of skyscrapers on the south side of Shennan Avenue, together creating the unified impression as the East entrance of the city’s CBD.